That title was a mouthful, huh? Don't let it throw you off! 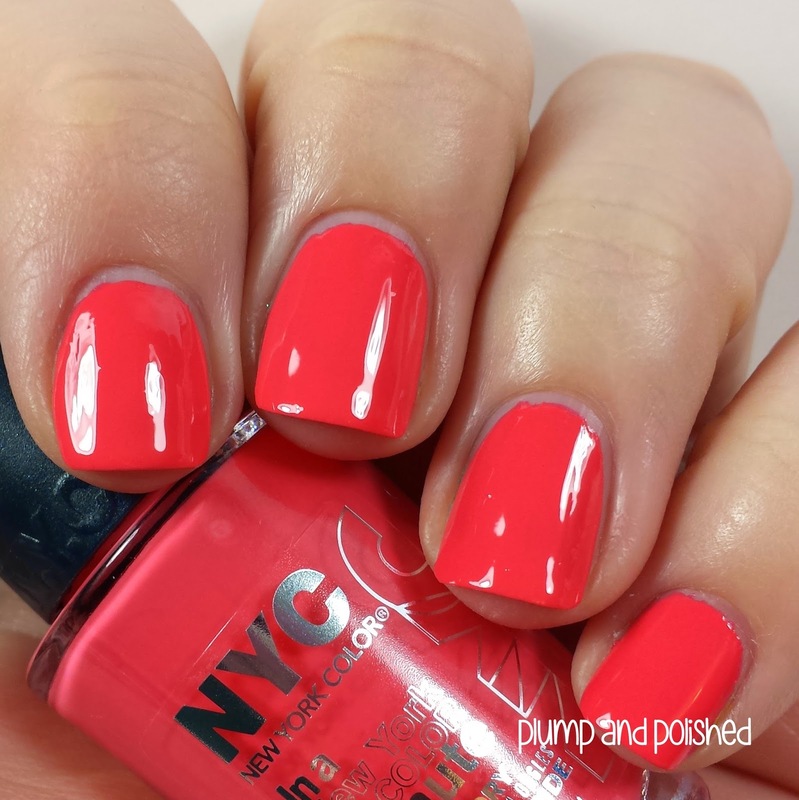 I have three shades from the newest NYC collection called The City Samba. 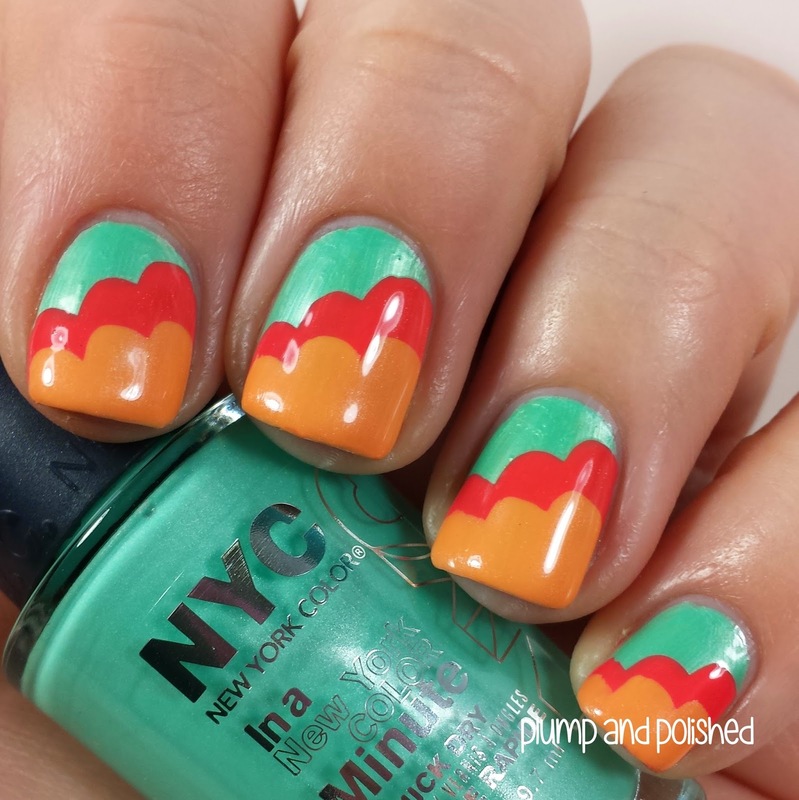 New York Color says, "These high pigment colors are infused with a hint of shimmer for brilliant, tropically-hued nails that won’t fade. The nail strengthening formula is infused with magnesium, iron, copper, and calcium for beautiful nails and specifically formulated to dry in lightning speed time to a dazzling, high shine finish. The shades: Amazon Green, Carnival Red, Copabanana, Jacaranda Flower, Ocean Blue, Palm Tree, Sweet Melon and Tropicoral." These polishes were a breeze to apply. I didn't have any issues with application. I would suggest applying them quickly rather than slowly. The formula is very true to the name and they dry within a few minutes. Just look at that shine! I was so surprised by how shiny they are on their own. To create this look, I simply used three brush strokes to make the ruffled cloud look. Once one color was dry, I moved on to the next. I finished it off with top coat to smooth over the edges. Because these polishes are so highly pigmented, I only needed one coat of each. This is actually my first experience with this brand and I'm so pleased with the results. 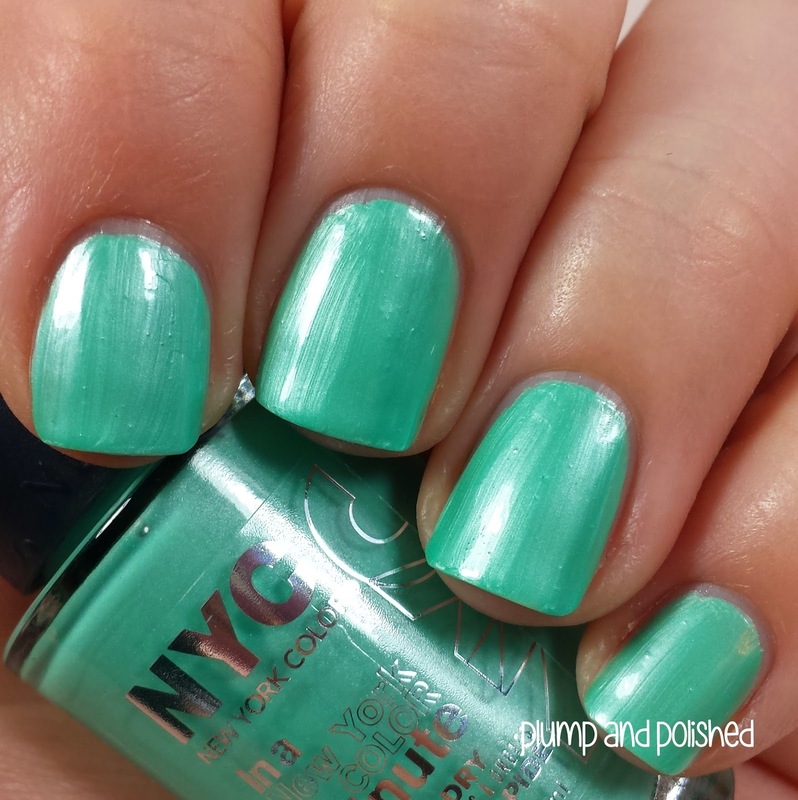 Check out NewYorkColor.com to find out where to buy! These polishes have a suggest retail price of $1.99 each. absolutely adore the end result! So perfect for the summer! It reminds me of a fiesta! Tropicoral is so pretty on it's own! I love how bright it is! But, what is up with the frosty greens this season? It would have been much prettier flat! As I said on Facebook--stop it!! 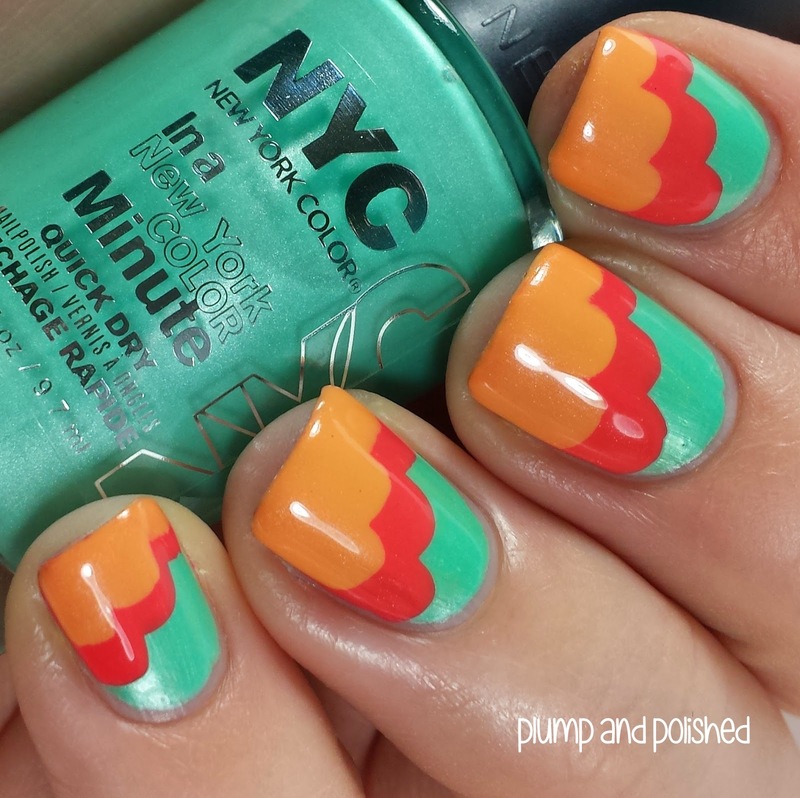 This is such a great manicure. The colors are so cheery! I think the frosty green would have been great for spring. When I read the press release for it, I thought it would have been a nice jade green. This is so cute!!! I got that collection in the mail too and I'm really excited to use them. All of the colors are so complimentary! I wish I had gotten all of them! The rest of the collection looks so awesome. They are all super pretty! 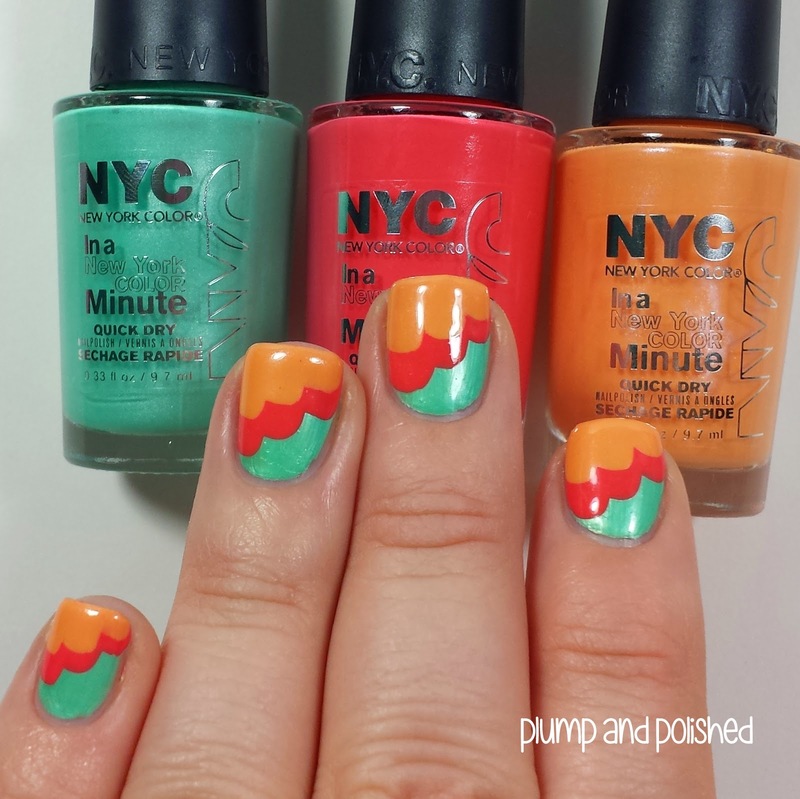 SInce I'm a coral lover this season, Tropicoral stands out the most to me though!! That's the one that won me over with this trio. I saw a purple one I liked a lot.